"I walk in at 5:15 for a 7 o'clock game. I remember wheeling in with my hockey bag. There were already fans there. I looked 10 years old. I had a shaved head from the playoffs in junior, a Mohawk. And I was a scrawny kid. It was all happening fast." With Wednesday night’s Calgary Flames home game, nearly 14 seasons later and almost seemingly in a blink of an eye, the Mississauga, Ontario-born Stajan will have reached an impressive 1,000 games in the NHL. Stajan’s path to the millennial landmark with the Flames started with the 2002 NHL Entry Draft, where he was drafted 57th overall by the Toronto Maple Leafs. As told to Scott Cruickshank of The Athletic, Stajan ushered in April of 2003 by signing his initial pro league contract and made his debut with the St. John Maple Leafs shortly thereafter, April 4. Stajan, however, was closer to the NHL than he thought. The very next day, his phone rang with news that he was being summoned to fill out the roster for the blue and white in the club’s final game of the season at Air Canada Centre. Well, if you’re No. 14 (which he wore at the time), you make your big-league arrival known by lighting the lamp for your first NHL career goal – and you do it on Hockey Night in Canada against the provincial rival Ottawa Senators. After nearly six seasons spent in Toronto, Stajan developed a reputation for a keenly observational hockey mind that has impressed coaches and teammates along the way. One coach in particular, Jamie Pringle, whose path has been intertwined with Stajan after first coaching him with the Belleville Bulls before eventually reconnecting in Calgary – where Stajan landed in a trade. "The way he was in junior is the same way he is here," said Pringle, then an assistant coach with the Bulls and now with the Flames. "Whether it's veteran guys or rookies, they all feel good going to him… He just had a real good grasp at an early age of the mentality and the personalities in the room and how we mesh them together." January 31, 2010, the Flames acquired Stajan through a seven-player trade. Going to Calgary alongside the centre were Niklas Hagman, Jamal Mayers and Ian White. Going to Toronto were Dion Phaneuf, Keith Aulie and Fredrik Sjostrom. While Stajan’s career-high in points (55) came in his last full season with the Maple Leafs in 2008-09, Flames fans will fondly recall Stajan’s timely heroics in Game 6 of the Flames’ 2015 first round Western Conference playoff series versus the Vancouver Canucks when he scored the game-winning, series-clinching goal. In between his first goal to the memorable playoff marker, one goal has stood out among the rest of Stajan’s 146 goals to this point at hockey’s highest level. March 22, 2014, Stajan was skating in his third game in a return from personal leave to deal with the tragic loss of his and wife Katie’s first-born child, Emerson. 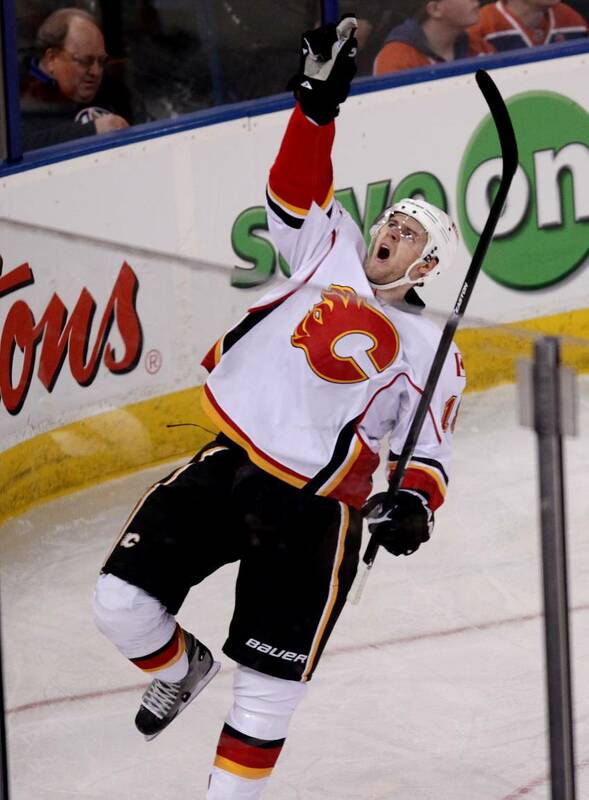 As fate would draw it up, Stajan’s raw emotion was on display as he made tribute to his son by pointing skyward after scoring on a penalty shot against the provincial rival Edmonton Oilers. The Stajans continue to honour Emerson, and Jan. 3, 2015 they hosted ‘A Night Under the Stars’ – an event that raised over $100,000 for the neonatal intensive care unit at Calgary's Foothills Medical Centre, while The Emerson Stajan Foundation was created in his memory to help benefit several charities while honouring his life. While his character, skill and on-ice intelligence helped Stajan along the way to the millennial milestone, his intangible qualities are what have made him a favourite among his teammates. In 2013, he was awarded the Ralph T. Scurfield Humanitarian Award for exemplifying the best on-ice perseverance, determination and leadership, along with a dedication to community service off the ice. Stajan was also the 2014 recipient of the J.R. McCaig Award, given to the player who best emulates respect and courtesy in both their professional and personal lives. Stajan’s example leads a young Flames dressing room who have taken heed to model aspects of their game and conduct after the well-respected vet. With the comforts of home ice at Scotiabank Saddledome, Stajan becomes the 317th player to reach the elite benchmark at puck drop of the Flames’ matchup against the Anaheim Ducks.